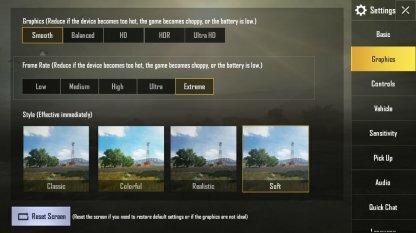 Check out this PUBG Mobile Recommended Settings and Control guide to know the best for lean shooting, frame rate, audio, graphics quality, vehicle, & button control settings! Lean shooting is a useful skill in PUBG Mobile, you can avoid being spotted while scouting for enemies or shot opportunities. Be sure to enable the "Peek & Fire" options in settings as this is very useful! You can enable the Lean options in your settings. Choose "Open Scope" and "Hold To Lean" as these activate your ADS automatically, allowing you to see enemies faster to shoot them down. Having a high frame rate makes the game perform better, allowing you to spot & shoot enemies more smoothly! So, always choose the maximum frame rate your current mobile phone will allow. How To Set Frame Rate To "Extreme"
Step 1 Set Quality to "Smooth"
Step 3 Set Frame Rate to "Extreme"
"Extreme" option may/may not appear depending on your current mobile phone specs. Some frame rate options may not show up on some Android models. Since a high frame rate is important in the game, choose the highest possible option your Android smartphone can use! Enabling 3D Touch controls will be based on finger pressure on-screen. Enabling this option makes controls more sensitive & can be useful for players who press wrong buttons often! Don't jump into a match right after enabling 3D Touch. 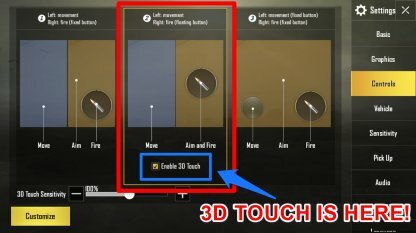 Go into Training and practice character movement, aiming, and shooting to get used to the 3D Touch option first! Always choose a higher frame rate and adjust your game quality to "smooth" or "balanced" to ensure smooth gameplay without overworking your mobile! Disabling anti-aliasing and the auto-adjust graphics will prevent your frame rate from fluctuating and making sure your mobile's processor won't lag or overload. 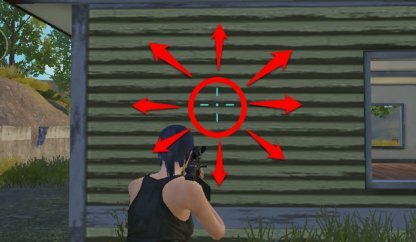 Changing your crosshair's color can provide a good contrast on-screen, allowing you to aim, spot, and shoot at enemies much more accurately. Aim Assist Enable for beginners! For experts or snipers, best to disable for head shots. Blocked By Wall Enable this option! Provides an easy-to-see marker to show that aim is blocked. 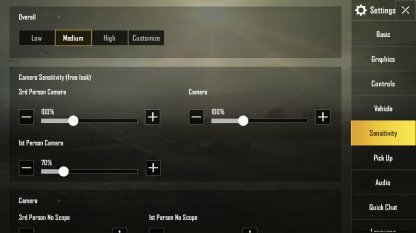 Bolt Action Rifle & Crossbow Firing Mode Option to shoot via "tap" or "release". Depends on player's preference. Shotgun Firing Mode Option to shoot via "tap" or "release". Depends on player's preference. Peek & Fire Enable this option! Peek & Fire allows spotting & shooting enemies without exposing location! Peek & Open Scope Enable if you want ADS to auto-open when you lean. Disable if you want to manually open ADS when leaning. Peek Options Options are "tap to lean" or "hold to lean". Choosing which option depends on player's preference. Display left-side fire button Recommended to enable but players who always mis-press this button can choose this to appear only when using ADS. Gyroscope Disable this option unless players are used to playing with a gyroscope. Auto-open doors This toggles automatic closing and opening of in-game doors. This depends on player's preference. Healing prompt For beginners, enable this option to use items with max. recovery amount. Experts can disable to choose which health item to consume. Fingerless aiming using the gyroscope can be useful to players, especially when turning during close range fights. Practice aiming with the gyroscope in Training to be more proficient! 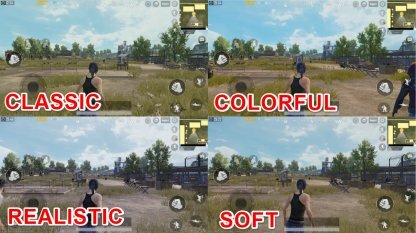 Adjusting game graphics can affect game & mobile performance so adjust settings accordingly that they won't overwork your mobile while having the highest frame rate possible! This option affects the textures of trees & structures in-game. Lowering this won't affect gameplay, allow you to choose a high frame rate, & lower quality may help in spotting enemies faster! 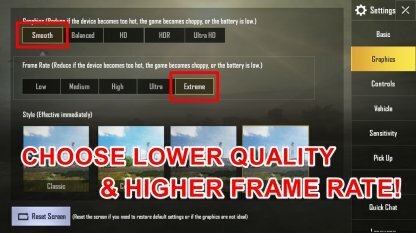 Frame rate is the most important factor to ensure PUBG Mobile runs smoothly. It's best to choose "Ultra" or "Extreme" but drop lower if these options compromise mobile's performance. 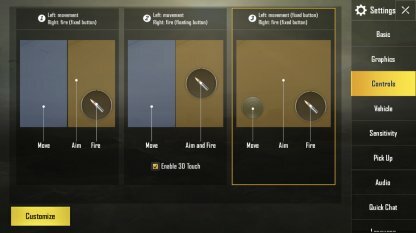 There are four color styles in PUBG Mobile. Pick the option that is bright & has high contrast to spot enemies faster. Anti-aliasing removes jagged lines in-game. Disable this option to reduce the heat generated by your mobile phone. Player controls can also be adjusted in the settings. Pick the one that works best for you and don't forget to try them out in Training before dropping into a match! 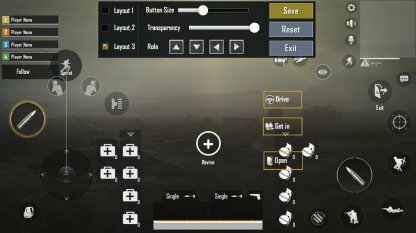 Press "Customize" located at the bottom of the controls settings screen to play around with the button size & on-screen location of your controls! 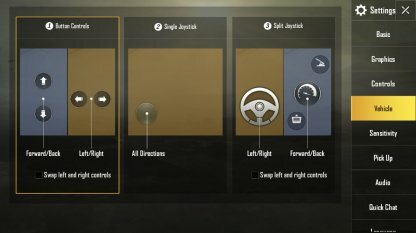 There are three options for driving vehicles in PUBG Mobile. The default setting is already easy to use but the right-most setting is visually easy to understand so find what works for you! 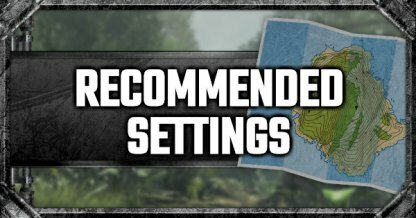 It's recommended that players adjust sensitivity settings according to preference. Focus on a wall in-game and move the cross-hair to know what sensitivity works for you. Before jumping into an actual match, try practicing your aim and adjusting sensitivity within Training to get used to your settings! Enabling the auto-loot option is best for beginners! It's more convenient as low level items are automatically swapped out when higher level items are picked up! 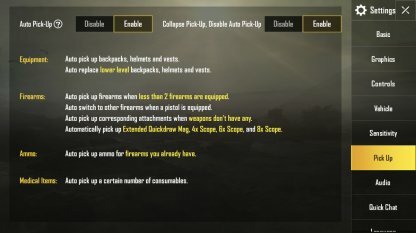 More experienced players should disable this option to manually pick up their weapons, attachments, equipment, & items of choice. Footsteps and gun shots are indicators of enemies in your vicinity so turn up the SFX volume to hear better & locate opponents faster. 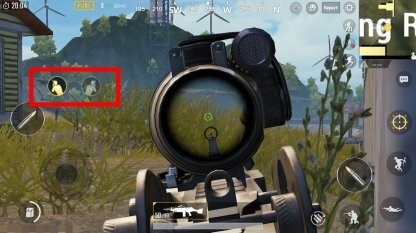 PUBG Mobile has a voice chat option! 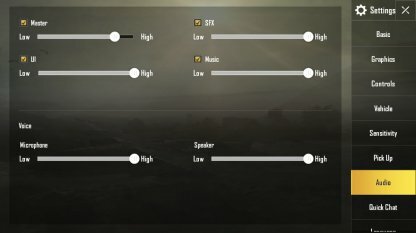 Set this to "Team" voice chat to coordinate with squad mates more efficiently to get that Chicken Dinner! Disable "World" Voice Chat So Enemies Can't Hear You! It's recommended to disable "World" voice chat as everyone (even opponents) will be able to hear you when you speak into your mic.